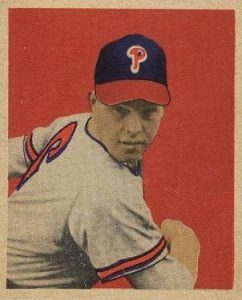 Robin Roberts was the most dominant National League pitcher of the early 1950s, leading the league in wins four consecutive seasons and taking the Philadelphia Phillies to their first World Series appearance in 35 years. A workhorse pitcher that the Phillies rotation was built upon, Roberts was also the team's most popular player. This list of the best Robin Roberts baseball cards features appearances from throughout his career, including several options from early Bowman and Topps sets. After serving in World War II, Roberts attended Michigan State University to play basketball rather than baseball. Roberts eventually tried out for the baseball team and took up pitching only because his coach needed a few more arms on the roster. 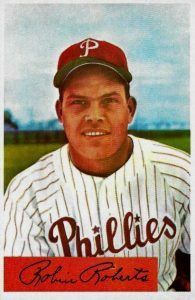 After leaving Michigan State, Roberts was signed by the Philadelphia Phillies and pitched his MLB debut in 1948. Shop for Professionally Graded Robin Roberts cards on eBay. Two seasons later, Roberts began an impressive streak of six consecutive seasons with 20 or more victories. That same year in 1950, the team became the one shining star for a franchise that hadn't appeared in a World Series since 1915 and wouldn't appear in another one until 1980. The Phillies' young roster earned the nickname of "The Whiz Kids" and they won the National League pennant, surprising everyone. Roberts continued his dominance of National League pitching by leading the league in wins from 1952 to 1955 and clocking 300-plus innings for six consecutive seasons from 1950-1955. Had the Cy Young Award existed at the time (it was first awarded in 1956), he would have undoubtedly come away with two or three during this amazing run. His 1952 performance was particularly noteworthy as he was 28-7 with a 2.59 ERA and led the league in complete games and innings pitched. 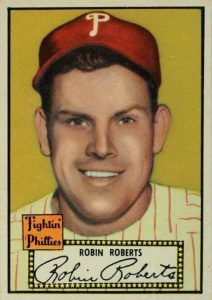 A pitching force during the 1950s, Roberts' 199 wins over the decade were just three behind Warren Spahn's leading total of 202 wins. On top of that, he never missed a start due to injury in the '50s and, at one point, he pitched 28 consecutive complete games. 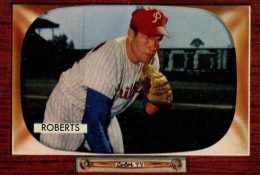 Roberts also holds the record for the most consecutive opening day starts for the same team, which he accomplished from 1950 to 1961 and he is the Phillies leader in complete games, games pitched, and innings pitched. The team honored him by making him the first Phillies player to have his jersey number retired. In 1976 he was elected to the Baseball Hall of Fame. Roberts bounced around to three teams in his final two seasons and you can find his last appearances as a player in 1965 Topps, while he was with the Baltimore Orioles, and 1966 Topps with the Houston Astros. For fans on a limited budget who might not be able to pick up early Robin Roberts cards, collectors can find a reprint of his 1952 Topps card in the 1997 Topps Star Rookie Reprints insert set and his 1949 Bowman rookie card was reprinted in 2001 Bowman Chrome. Michigan State Spartans fans can find a MSU autographed patch signed by Roberts in 2008 Donruss Americana. Although Roberts is sometimes overlooked by fans in favor of other pitchers from the era, this gives collectors looking for strong value in their purchases many appealing options. In building this list of the top Robin Roberts baseball cards, card value is a main determining factor along with card design and each set's historical importance to the hobby. 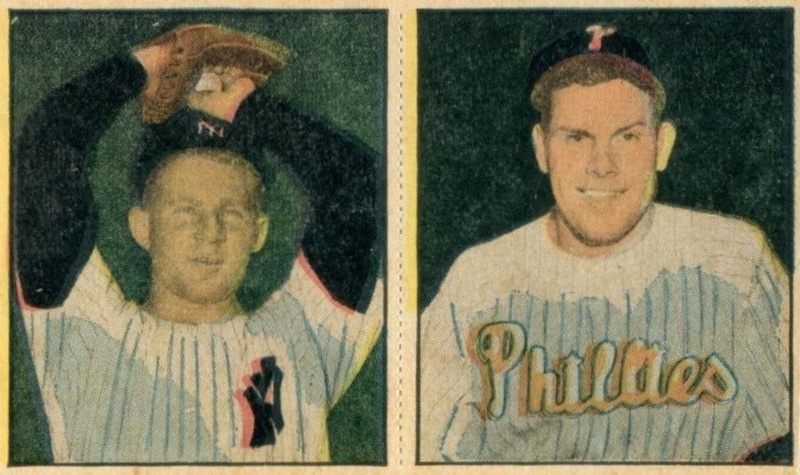 The 1951 Berk Ross doubles set came in panels of two cards that were frequently separated by collectors at the time. The images used are color tinted and the set is called "Parade of Champions" on the card's reverse, earning the release a nickname that has stuck over the years. Roberts shares his card with an early appearance by New York Yankees legend Whitey Ford, giving complete versions of the card a significant value boost. Separated versions hold about half the value of combined versions. 1952 Red Man Tobacco issued the first major tobacco-based card set since the tobacco card era of the early 20th century. Each league had 25 players and one manager selected by writers of The Sporting News magazine to be featured in the set. Collectors could separate the tabs at the bottom of the card and send them to Red Man in exchange for a baseball cap. For those collectors not concerned with the tab, cards that have it removed are worth a fraction as compared to the complete versions and it offers a great opportunity to own original Hall of Fame cards on a budget. 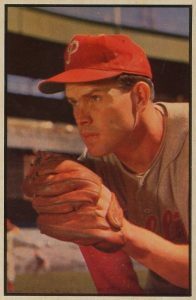 Roberts was included in Topps sets sporadically in the 1950s while appearing in each of the Bowman sets from 1949 to 1955. 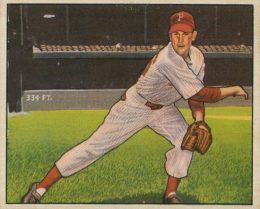 His single appearance on cardboard in 1954 was in the Bowman set and Roberts is shown at the peak of his pitching powers. He led the National League in strikeouts during 1953 with 198 K's and again in 1954 with 185 strikeouts. Although there was no Cy Young winner at the time, Roberts was a regular finalist for the Most Valuable Player Award and he finished in the top ten in MVP voting five out of six years between 1950 and 1955. Again, Roberts' only baseball card appearance during 1955 was in Bowman's iconic TV screen design. The set would prove to be Bowman's final release as the company was purchased by Topps the following year. On the reverse side of the card, Bowman tried something new as they included short essays attributed to they player about an event they experienced in the league. Roberts' card features a story on "The Best Fielding Play I've Seen," which details how Brooklyn Dodger's outfield Duke Snider robbed the Phillies of a victory by making a great catch. Although Topps increased the physical size of their baseball cards in 1952, Bowman continued to keep their card dimensions smaller in their 1952 set. Roberts appears in both the Bowman and Topps products in 1952 (more on Topps in a bit). While the official Bowman release remained in the smaller size, rare black-and-white and color proofs (including some of Roberts' card) have been found showing that the card company was experimenting with larger editions that they wouldn't ultimately use until 1953 Bowman. 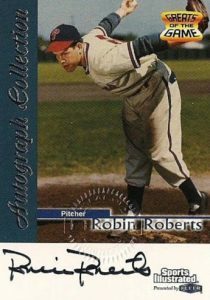 Although the dimensions of the cards in 1950 Bowman are nearly square, Roberts is one of the few players featured on a horizontally-oriented card as he appears to throw a pitch toward the camera. Card backs remind us that Roberts threw right-handed but batted lefty and he was a pretty good hitter (for a pitcher). Over the course of his career, Robin had more than 100 career RBI, hit five home runs, and drew 135 walks. 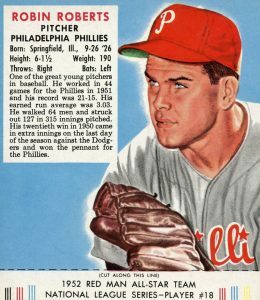 The fact that highly-graded copies of Roberts' appearance in 1953 Bowman are frequently his highest valued cards speaks to the popularity that the first full-color photography set still has today. The intense photograph features his face and his glove as he possibly looks to the catcher for his sign. The reverse side informs us that Roberts' 28 wins during the 1952 season were the most by a pitcher since Dizzy Dean won 28 games during the 1935 season. The mark wouldn't be topped until Denny McClain won 31 games for the Detroit Tigers in 1968. One of the first certified autographs for Roberts can be found in 1999 Fleer Sports Illustrated Greats Of The Game. With an impressive checklist of past and present stars, each pack had one of 80 different signers and every autograph has a notary stamp in the middle of the card with "Fleer's Mark of Authenticity." Robert's signature is notable in that the two "R" letters beginning his first and last name often look like the letter "P" rather than "R." His autograph is also very vertical with little to no slant either to the left or right. Robin Roberts debuted in a Topps set in 1952 and it would be his only appearance with the famed card producer until 1956 Topps. The first series of '52 Topps, which includes Roberts, can be found with backs that are printed with red or black coloring and collectors have placed a slight premium on the black cards. Although Roberts never came away with an MVP award, his pitching performance in 1952 earned him the Sporting News Major League Player of the Year Award as the top player in baseball. 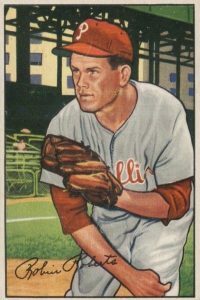 Roberts made his baseball card premiere in 1949 Bowman after debuting with the Phillies for 20 starts in the 1948 season. The card back details Roberts' time with the Phillies minor league teams, including the Wilmington Blue Rocks. Because 1949 Bowman did not include nameplates on the cards until after card #109, Roberts' card #46 is bare. However, you can find variations in the cardboard stock used as it could be white or gray. Mint copies of early Bowman cards are very rare to come upon and so even near-mint graded copies of Roberts' rookie top $500 at auction.